After screening the documentary “Following the Ninth: in the footsteps of Beethoven’s final symphony” in Hawaii, Anne Ku went to Vermont to meet the director and Boston to see the orchestral performance. There is a new movement taking place. It’s called “Following the Ninth.” You’ll have to see the 78-minute documentary “Following the Ninth” to know that it’s not just about Beethoven’s last symphony. It’s about how the “Ode to Joy” was used in several world events as a song of solidarity and hope: Tian An Men Square (1989), Fall of the Berlin Wall (1989), Tsunami in Japan (2011), and the Pinochet dictatorship in Chile. I came across this documentary movie of Beethoven’s Ninth Symphony while searching for background information on “Ode to Joy” for a new arrangement I made for easy piano ensemble. When the DVD became available, I ordered two copies and the accompanying book “Journeys with Beethoven: Following the Ninth, and Beyond” by Kerry Candaele and Greg Mitchell. 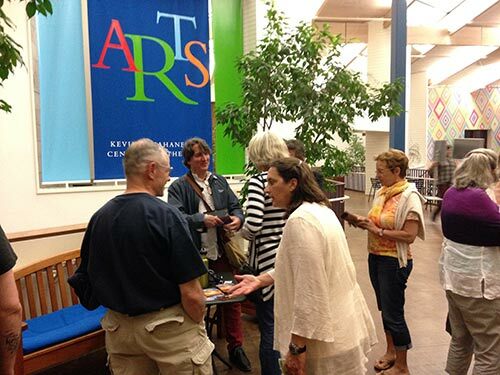 On Thursday April 23, 2015, I showed Kerry Candaele’s “Following the Ninth” at University of Hawaii Maui College, effectively the Hawaii premiere, to a full house consisting of three classes (world history, music literature, and music in world cultures), other staff, faculty, and students, and the general public. The publicity announcements recommended viewers to arrive early to get free popcorn (sponsored by Bounty Music, the local music store in Kahului) and that we’d start promptly at 1:30 pm. This event was part of Music Week in which nearly all our 25 classes were open to the public. I skyped in the director to see the packed lecture hall, just as I did the following Tuesday to my two music classes to complete their film review assignments. Following the premiere, I led my “Instrumental Ensemble” class to play the “Ode to Joy” on various digital pianos to accompany soprano Anne Shapiro visiting from the Bay Area. I was surprised by the feedback to the movie. Several people said they cried. They ordered the DVD online and watched it again with their friends and family. My colleague from Hunan, China, said she had never seen the footage of Tian An Men Square protest in 1989 even though she was in China at the time. My friend from the Netherlands remembered the Fall of the Berlin Wall. I didn’t know the film would cause such an emotional reaction. When I learned of the movie’s screening in Vermont, I decided to plan my summer holidays around it. I would cut short my Miami trip, to arrive back in Boston, in time for a 3.5 hour drive through New Hampshire to Middlebury College, Vermont on July 15th. I wanted to meet the director, Kerry Candaele, in person. Watching the movie in the grand concert hall of the arts center of Middlebury College, as a member of the audience rather than viewing the DVD to create the film review assignment for my classes or sitting in the lecture theatre on its first screening, was quite a different experience. I can imagine myself watching it more than once, in different situations, with different people. There are tons of content in the 78-minutes. To understand more, I had to read the 179-page book. What was so special about the Ninth? Why did Jeremy Yudkin devote an entire chapter to Beethoven in the textbook we used for music literature? 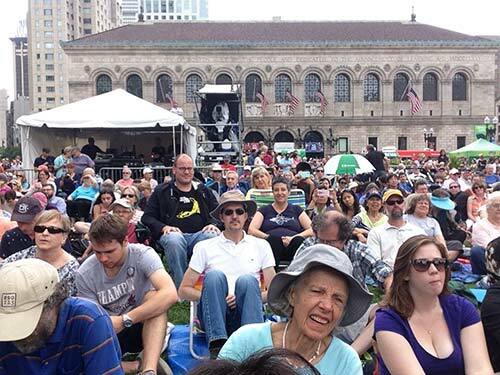 A week and a half later, I found myself seated in a packed audience again, this time on foldable lawn chairs outdoors in Copley Square, central Boston. The much-respected Handel and Haydn Society was celebrating its 200th anniversary with a full performance of Beethoven’s Ninth. All morning we were concerned about rain and the threat of thunderstorm. At 6 am, the forecast was 90% rain. At 11 am, the H+H website announced the concert would not be cancelled or moved indoors. By then, there was 50% chance of rain, which decreased to 30% when we arrived at Copley Square T-station at noon. 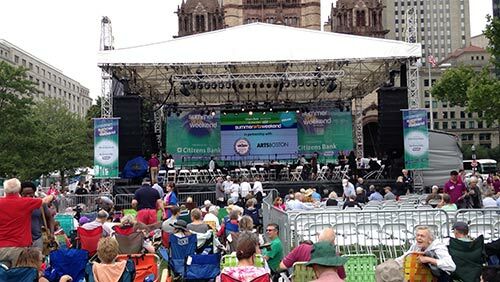 What’s missing in Boston Globe’s review of this Sunday lunchtime concert of July 26, 2015 was that the threat of rain continued until just after the third movement. At that point, the sun suddenly appeared through the clouds, spotlighting directly on Copley Square. As a prelude to the much anticipated “Ode to Joy,” it truly was a ray of hope, warmly assuring us that there would not be rain at all. That Sunday was my first time attending a performance of Beethoven’s Ninth. I was filled with emotion. I didn’t know why. When the last note ended, the audience unanimously leapt to their feet for a long standing ovation. Were they clapping for the orchestra or the soloists or Beethoven or all of the above? It would definitely sound better indoors, to accommodate the delicate period instruments and combat the windy day. Close miking might have helped outdoors. That would be my next destination: an indoor performance of the Ninth and sight-reading piano duets for the Ninth Symphony.